The time has FINALLY come! 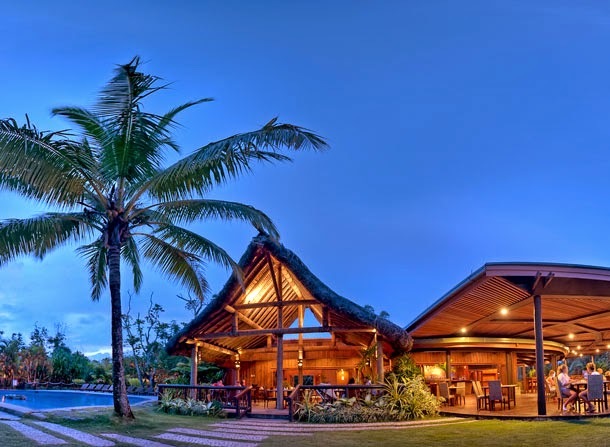 The Huz and I are headed to New Zealand, Australia, and Fiji for a couple weeks. After years of saving and planning this crazy adventure is finally happening!!! So I will be away from this blog (and everything else) with incredibly limited access to technology (yay!) for the next couple weeks. I'm guessing I will still be posting some fun pictures on Instagram when possible for any of you that follow me there (avidreader25). Have a great couple weeks and I will be sure to share photos when I return. 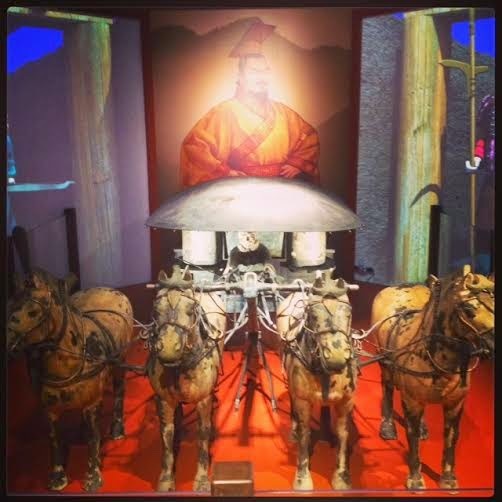 Incredible to see the real warriors, which are 2,200 years old! 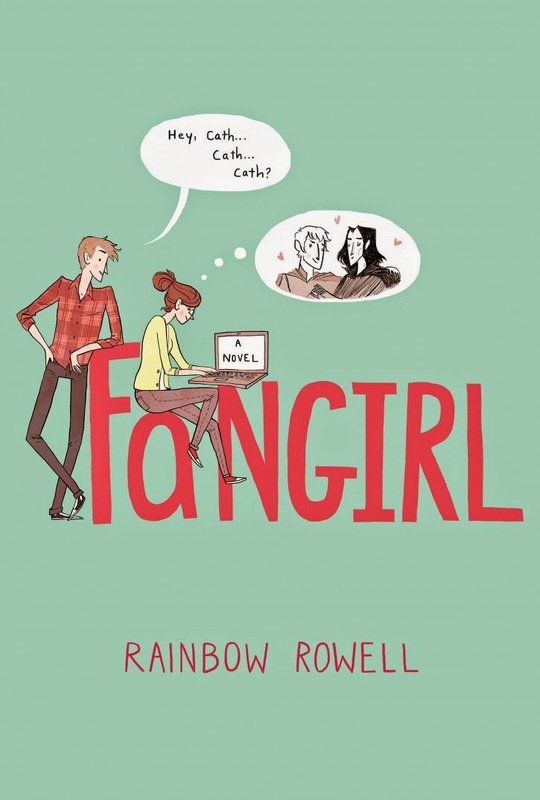 Rowell has made a name for herself with her sweet stories and realistic characters. So far I’ve read and loved Attachments and Eleanor and Park, so I had high expectations going into this one. The plot centers on twin sisters, Cath and Wren, who are heading off to college for their freshman year. Wren can’t wait for the parties and new experiences, while Cath is having a hard time leaving her dorm room. She’s a devoted writer of fan fiction for the Simon Snow series (Harry Potteresque books.) Her new roommate Reagan is intimidating, her Dad's home alone and struggling with mental illness and Cath is having a hard time finding her way. The beginning of the book is slow moving as Cath meanders through her classes and we depend more heavily on bits from the Simon Snow books and from her fan fiction chapters. As the novel progresses we get to know Cath a bit more and can understand why she’s hesitant to leave home and welcome change. The second half of the book really clicked for me. I remember feeling nervous and self-conscious my freshman year in college. It can be such a tough time, especially if you aren’t a party girl, which I was not. You’re away from your high school friends and your home and I think it takes everyone a bit of time to find their equilibrium. I read a few reviews that bashed Cath, calling her whiny or annoying. For me the crucial thing to remember is that she’s an 18-year-old girl who is struggling to adjust. I think just about all 18-year-old girls would fall into the whiny category at times, so her voice rang true for me. Cath’s struggle becomes clearer as we learn her character’s history and her apprehension begins to make more sense. The book also relies less on the Simon Snow gimmick as we become attached to Cath. One of the most interesting aspects of the story, in my opinion, was the twin’s relationship. I have a sister who is a very different personality from me and I can’t imagine if we’d gone to college at the same time. Having a twin means you have a built in best friend who looks out for you, but it also means it can be hard to make your own friends or start a new phase in life. Much of the second half of the book focuses on Cath's relationship with her new boyfriend, Levi. Some of their scenes made me grin like a kid. I kept thinking of my boyfriend during my freshman year in college; the infatuation, the thrill of just being near that person. That stage in a relationship is so sweet and innocent. I loved that the book didn’t end as soon as they got together. Instead it explored some of the other complicated waters of an early relationship. The ending was a bit abrupt, but overall it worked. BOTTOM LINE: I’m continually surprised by Rowell’s ability to make me connect with characters. Eleanor and Park is still my favorite, but this was a sweet walk down memory lane. We were all vulnerable, insecure college freshman once! The summary of this novel, which I read first, gave away a surprising amount of the story. In all honesty I think Trollope’s novels are less about the plot than they are about the social interaction and moral development of the characters, so it didn’t really bother me. The Dale women, Lily and her sister Bell and their mother, were wonderful. At their core all they want is for the others to find true happiness. They are fiercely protective of each other and their wishes. Some of my favorite scenes in the book are when they stand up for the decisions someone in their family has made, without asking any questions of each other. Lily talks to the local doctor, James Crofts, in an effort to secure happiness for her sister. Their mother talks to the girls’ uncle about a potential match but refuses to force or encourage her daughter to make the match against her will. They are strong women who refuse to betray each other for a shot at money or luxury. I keep finding shades of Austen in all of the Trollope I read. Both authors share similar themes and styles, though Austen's work has a bit more bite. This one reminded me so much of Sense and Sensibility. Bell is like Eleanor, steady and logical. Lily is brasher and reminded me so much of Marianne. She falls in love with an unworthy man, turning down someone who would truly be a great match. Unfortunately for Lily, unlike Marianne she never quite recovers from that love. The girls’ mother is an interesting character as well. She struggles with whether she's done right by her children, even though they love her dearly. She worries that they are possibly giving up opportunities out of a loyalty to her. It's the endless struggle of any parents, constantly asking yourself if you’re making the best choices for your kids. The male characters in this novel are a mixed bag. Eames is a worthy man, I found myself rooting for him. The girls’ uncle is harsh and struggles to connect with them. He does love them, but that feeling is wrapped deep within his other layers of formality and stiffness. He has such a hard time conveying his feelings and his actions often come across as obligation instead of love. Crosbie is just a jerk, to put it nicely. I wanted to smack him and he deserved his fate. Side note: We also get to see Griselda again and it’s a bit tragic to see what her life has become. My only real complaint about this one was that I wanted something better for Lily. I wanted her to find love. I wanted her to realize that she deserved someone better than Crosbie. I wanted a happy ending for her because it seemed like the novel was begging for one! It’s definitely not that I think everyone needs to be married to be happy, but it felt like she gave up on pursuing any happiness in some misplaced sense of loyalty for a man that didn’t deserve her. BOTTOM LINE: Another delightful read. It’s not my favorite of the series, but I once again enjoyed being lost in Trollope’s world of Barsetshire. I’m skipping September because I will be out of the country for half of it. In October I’ll be reading the sixth and final book in the series. I hope you’ll join me! 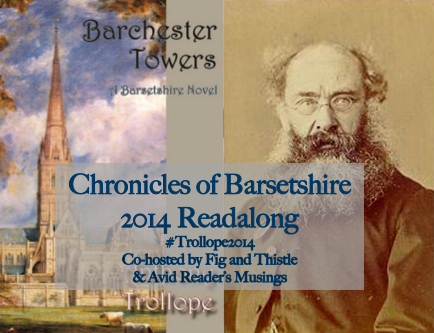 Share your wrap up post with all of us at the end of the month and tweet your thoughts at #Trollope2014. What a whirlwind novel! The whole story is told from the point of view of Paul, a middle aged man on his way to dinner with his wife, his brother Serge and his sister-in-law. The quartet is meeting at a fancy restaurant and as dinner progresses we learn the reason for the gathering. Without including any spoilers I can say that the book is dark, but so good. It plays with the ideas of nature vs. nurture and sibling rivalry in a fascinating way. Serge is expected to be the next Prime Minister and his fame attracts additional attention to their table. As Paul’s patience shortens and each new course is served the tension mounts. I loved the details of the book. The interactions with the waiter, the descriptions of the food, all of it added to the pleasure of reading. It reminded me a bit of We Need to Talk About Kevin in the way that an unreliable narrator is talking about the present day and also flashing back to past action in the story. We learn things in bits and pieces. The reader has no idea if Paul is skewing the story to show his family in a better light. We also don’t fully understand his wife’s position on everything at first. The relationship between the siblings is both tense and primal. We don’t ever really think our siblings have changed from those individuals we grew up with. We see our siblings in a completely different way than the rest of the world does. We know their secrets and their weaknesses. In some ways we see them more clearly, but we also bring our own immature prejudices to the relationship because we have a shared history when we were both sensitive and vulnerable. There are books where the characters are not likeable and that ruins it, but I think often that just means the writing isn’t as good as it should be. 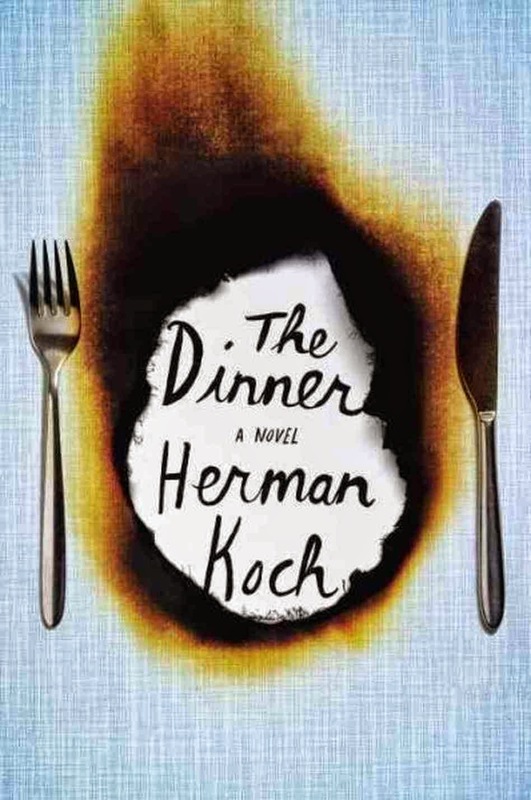 This novel is full of unlikeable characters but that had no impact on my enjoyment. BOTTOM LINE: I honestly couldn’t put it down. I read the whole thing in one day. Highly recommended for whenever you’re in the mood for a dark twisty look at family relationships. 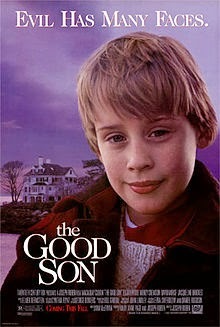 Pairing Books with Movies: The Good Son (1993) is a perfect pairing with The Dinner. It stars Macaulay Culkin and Elijah Wood as two young cousins who become friends but then one of them starts to show signs of violence. It’s creepy and shares some similar themes with the book. 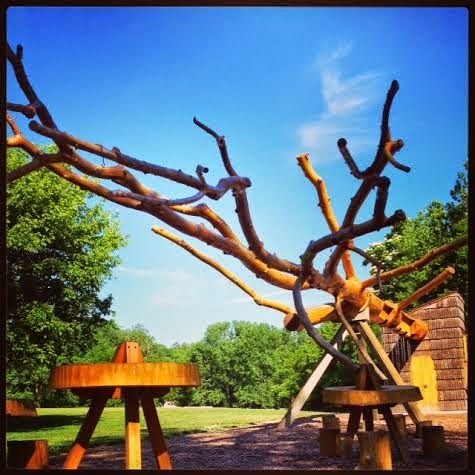 The Chop Stick sculpture at the Indiana Museum of Art. It wasn’t planned, but in the last month I read three books in a row that dealt with the personal lives of famous authors. They were: My Life in Middlemarch, Under the Wide and Starry Sky and The Secret Diaries of Charlotte Bronte. Only the first is nonfiction, the second two were well researched fictionalized accounts. It was an unexpected delight to compare the three books. Each author was received in a different way during their lifetime. Each one’s personal life affected their work in a different way. In the end each of the books was a lovely reminder that authors are just people. They make mistakes, deal with grief, and fall in love just like the rest of us. There are certain books that become part of who we are. For Mead, one of those books is Middlemarch. This is a nonfiction account of her love of the book and experience with it. It is part memoir, part literary analysis and part biography of Eliot. This result is a lovely view of the importance of books in the lives of a reader. 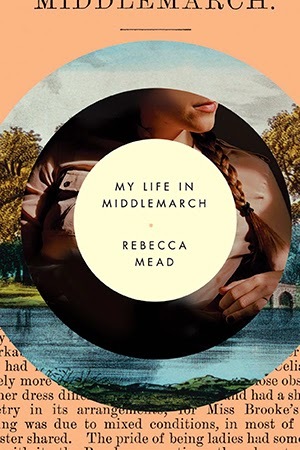 Mead explores the context in which Middlemarch was written as she discusses its literary importance. She also talks about different commentaries and literary criticisms that have been written regarding the novel. She explores Eliot’s relationship with her stepsons and with the man who she spent her life with. Their unconventional relationship influenced the way she was perceived throughout the literary world. Eliot’s relationship later in life with a younger man actually reminded me quite a bit of her famous character Dorthea’s situation. One important thing Mead touches on is the way books change for us depending on when we read them. I’ve had similar experiences with this in my own reading and it never fails to surprise me. I can read a book as a freshman in high school and be enamored with the rebellious teenager and their lust for life. I’ll re-read the same book five years later and identify with the older sister who is worried for her sibling. Then I’ll re-read it again after a few years have passed and be blown away by how the parents in the novel are handling the situation. I notice different parts of the story each time, I relate to different characters and experiences depending on what I’ve gone through. It thrills me to think of what I’ll find in my favorite books as I continue to re-read them throughout my life. BOTTOM LINE: I loved Mead’s observations about both the book and Eliot. It made me think of the books that have become part of who I am. It’s also made me want to read all the rest of Eliot’s work and The Mill on the Floss is at the top of my list! How did I not know about this New York Times column before now?!?! The series started in 2012 and features a new individual each time. Sometimes it’s an author, like David Sedaris, Neil Gaiman, or Jhumpa Lahiri; other times it’s an actor like Emma Thompson or Bryan Cranston. No matter who it is there are answers filled with a love of books and the joy they hold within their covers. Each person is asked questions about their reading habits, favorite books, etc. 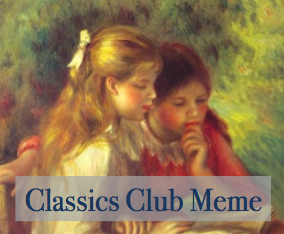 We learn what’s on their nightstand, what they loved to read as a child and what books have made them laugh or cry. This sounds like a simple enough Q&A series, but it’s the eloquent answers that make it so wonderful. Keep in mind that the interviewees are usually highly intelligent people and accomplished authors. Their answers are sometimes beautiful insights into who they are as a person. I loved reading a few of the Q&As at a time. I could easily dip into the book at any point and then set it back down. The book itself includes an illustration of the individual being interviewed, which was a great addition. It also has a few compiled lists sprinkled in between the interviews with compiled answers on different topics. 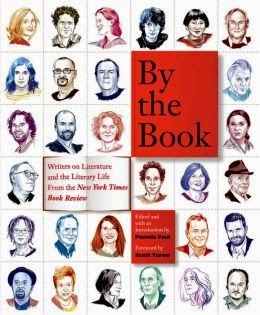 For example there’s a sidebar with half a dozen author’s thoughts on reading James Joyce. One of my favorite parts was compiling my own list of books based on the authors' recommendations. There are so many new books that I’m planning to check out. I also loved seeing their guilty admittances of what they haven't read yet or what they didn’t like. It was reassuring to realize even the most incredible authors have books that just don’t work for them. I was surprised by the number of overlaps between interviews. There were some common themes that kept popping up in different interviews. Many authors cited A Wrinkle in Time or the Encyclopedia Brown series as a childhood favorite. There were also quite a few that said The Grapes of Wrath, Hilary Mantel, St. Aubyn’s Melrose novels, and Proust were wonderful and they couldn’t stand reading Ulysses. BOTTOM LINE: I just loved these interviews. I felt like I was part of a wide-reaching community of book lovers that rises above profession or background. I was introduced to new authors I will definitely be trying soon and I will keep my eye out for this column in the future! **I received a review copy for an honest review. 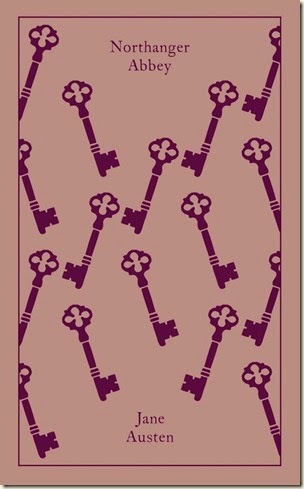 It’s been a decade since I read Northanger Abbey for the first time. Re-reading it was such a delight. Catherine Morland is a young woman who lets her imagination run wild and loves to get lost in novels. While staying in Bath with family friends she meets two sets of brothers and sisters. The first is the Thorpes, Isabella and her brother John, who become insufferable as their true nature is slowly revealed. One of my favorite parts in the novel is when Catherine finally stands up to them, refusing to go along with their plans and cancel on her other friends again. The other pair of siblings is Henry Tilney and his sister Eleanor. Austen does a wonderful job comparing and contrasting the two sets of siblings, demonstrating a false nature vs. a genuine one. After getting to know Henry and Eleanor in Bath, Catherine is eventually invited to stay at their home, Northanger Abbey. There the young woman’s love of gothic novels gets the best of her as she imagines dramatic tales unfolding around her. One thing that set Northanger Abbey apart from Austen’s other work is the relationship between Catherine and Henry. In most Austen novels the heroine and her eventual match don’t like each other or have some huge obstacle to overcome at the beginning of the novel. In Northanger Abbey, Catherine and Henry like each other from the start. I love their sweet flirtation. Henry is patient with her and teases her in a kind way. He also rises above his father and his brother when it comes to his priorities and moral compass. He’s a truly good man and one of my favorite male Austen characters. - Henry is a word nerd! At one point in the story he corrects Catherine in the way she uses the word “nice.” He does it in a playful, teasing way, but I love that he is a grammar lover. - I’m reading Trollope right now as well and the goal of marrying for money is prevalent in both books. It never ends well for anyone. - I love Austen’s jab about putting down other novelists. She pokes fun at the fact that high-brow authors of her time period often bash the authors of novels. She suggests that instead they should all stand up for each other. BOTTOM LINE: Northanger Abbey is fun and sweet. It’s a quick read and a great way to meet Austen for the first time. It’s not my favorite of her books, but Austen is my literary pizza, you can’t find a “bad” Austen novel. I read this as part of the Austen in August event hosted by Lost Generation Reader. For years I've slowly been working my way through the complete works of William Shakespeare. In addition to reading his plays, my goal is to see a live performance and a film version (when available) of each one. I'm going to keep track of what I've seen in this post and I'll link to reviews of the plays here as well. If you want to join me please do and feel free to grab the button above! *I've listed the plays in the order and category that they are listed in the Riverside Shakespeare. I only cross completely through the title when I've completed all three categories. 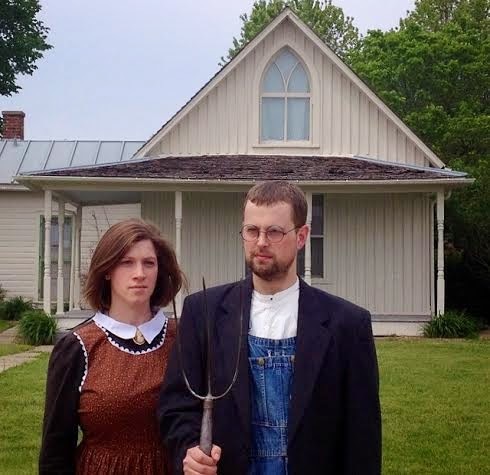 The Huz and I at the original American Gothic house in Eldon, IA. It now doubles as the Pitchfork Pie Stand! It’s been almost a decade since the first time I read this book. Years later I realized it was just as hilarious when I reread it as it was the first time around. Adams created characters and situations that make you laugh out loud no matter where you are. His droll sense of humor is legendary and just when your stomach stops hurting from laughing, he throws you another curveball, like an alien race that tortures people by making them listen to horrible poetry. It all starts with a quiet British man named Arthur Dent who unknowingly hitches a ride on a spaceship just before the earth is destroyed. This book is the first in a five part "trilogy" featuring a small band of oddballs who travel through space. 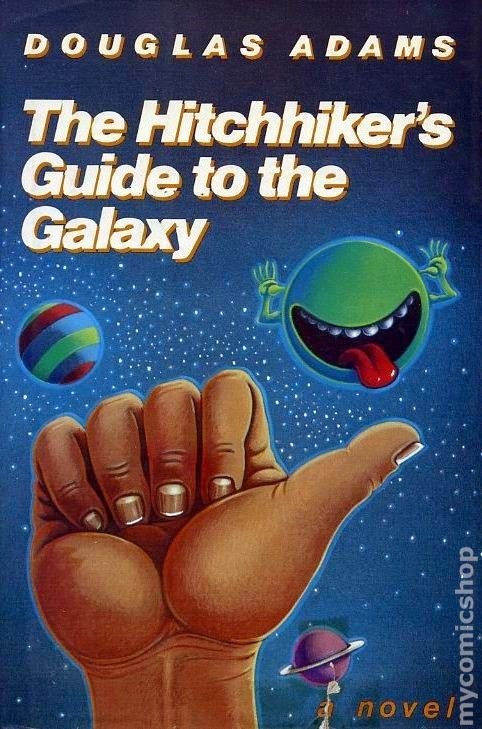 The main characters include unforgettable individuals like Ford Prefect, Zaphod Beeblebrox and Trillian. My two personal favorites are Dent, whose bumbling, sweet-natured confusion is irresistible and Marvin, a depressed robot who is constantly bemoaning the fact that no one listens to him. I also have a soft spot for Deep Thought, the mega computer created to answer the question of the meaning of life. It’s impossible to fully capture just what it is about this book that I love so much. Yes, it’s funny, but there more to it. In Dent we have a relatable lead that is completely confused by his new space surroundings. He is human, in every sense of the word, so we understand his bafflement and we root for him. BOTTOM LINE: One of my absolute favorite books of all time. I would recommend Adam's writing to most people, but I would say if you love Monty Python's sense of humor these books are an absolute must. Sit back and enjoy the ridiculousness and don't forget your towel. What are your thoughts on adaptions of classics (mini-series/ movies / modern versions)? Are there any good ones? Is it better to read the book first? When a classic is reworked in the modern world I think just as true that it can be good or bad. A few of my favorites include 10 Things I Hate About You, a re-telling of The Taming of the Shrew, Clueless, a re-telling of Emma and then Much Ado About Nothing (Joss Whedon’s 2013 version.) All three movies are well-cast and fun. The first two deviated from the original text, but they did it in a fun way that kept the heart of the story intact. Sometimes it’s fun to see a variety of versions of the same story. There are a dozen version of Jane Eyre, each with its own twist. I thought Michael Fassbender made a fantastic Mr. Rochester in the 2011 version, but I loved the 2006 mini-series more. The Jane from that version, Ruth Wilson, was so perfect. Great Expectations has had a recent resurgence of remakes. I loved the 2012 version with Ralph Fiennes, but I thought the 2011 version was off-putting. The actor who played Pip (Douglas Booth) was too pretty for the role. It just didn’t work. There’s another 1998 modern version with Ethan Hawke that is interesting. I like it, but not because it sticks closely to the original story. In my opinion you should always read the book first. Then take the adaptation with a grain of salt, don’t expect it to be a perfect recreation of the story in your head. Allow the movie or mini-series to enhance your experience with the book instead of trying to compare them scene for scene. What are your favorite versions of classics on the big screen? 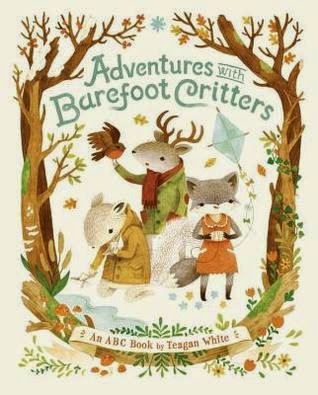 This sweet children's book features woodland creatures, (a fox, deer, squirrel and inexplicably a Triceratops), having adventures. Each page is dedicated to a single letter of the alphabet and has a cute little sentence paired with rustic illustrations. BOTTOM LINE: A very cute children’s book that introduces kids to the alphabet. 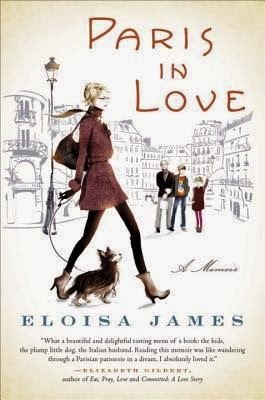 This memoir is based on the author’s time in Paris. She moves to the famous city from her home in New Jersey with her two children and Italian husband in tow. The family’s goal is to embrace a sweeter, slower life for a single year, savoring food and experiences. The author, by her own admission, compiled her Facebook and Twitter posts about her time in Paris to create this “memoir.” The result is a completely disjointed book. There are funny bits and astute observations, but that doesn’t take away from the fact that the entire book is a series of non sequiturs with the loosest of threads holding it together. She’ll say something about her daughter’s difficult time adjusting to her new school and then the very next line is about a delicious meal she ate and then the next mentions their overweight chihuahua. It was sweet to read about the wonderful meals she ate and museums she saw, but for me it wasn’t enough to justify a book. The format was too fragmented and I probably would have enjoyed it more if I’d read them on Facebook, in the original form they were intended. BOTTOM LINE: There are too many great Parisian memoirs out there to make this one worthwhile. Read it only if you’re in the mood for a tiny taste of Paris and don’t care what form it comes in. Kinsey’s first marriage has always been an unknown for readers. In this book we get to explore that relationship and in doing so we learn more about the tough P.I. we’ve come to know and love. 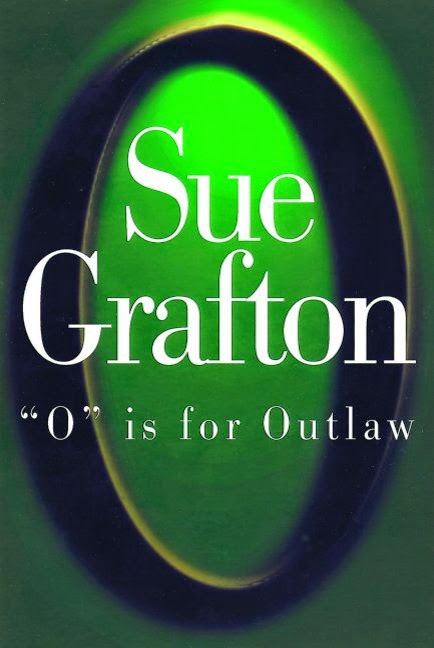 O is for Outlaw has the same expected set up of the other novels, it just deals with Kinsey’s past instead of a stranger’s this time. From bar fights to Vietnam Kinsey digs into her ex’s past and the confusing circumstances surrounding their break-up. 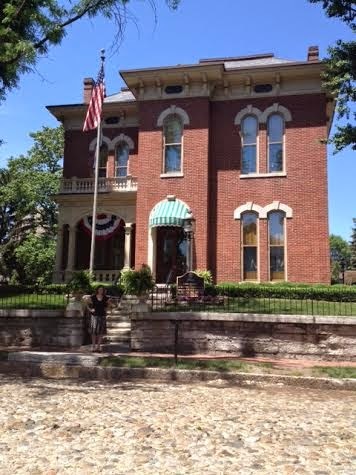 She also makes a quick trip to Louisville, Ky. and spends a bit of time in the southern city. BOTTOM LINE: A good addition to the series and a fun read. **There’s one glaring thing I have to mention about the audio version of this book. All of the books in this series, from “A is for Alibi” to “N is for Noose” are read by Judy Kaye. She always did a fantastic job and I have a feeling her narration is a big part of why I’ve enjoyed these. This latest installment is read by Mary Peiffer. She doesn’t do a bad job; it’s just not the voice I’ve grown to connect with Kinsey Millhone. I have no idea why they switched narrators midway through the series, but it’s definitely a disappointment. 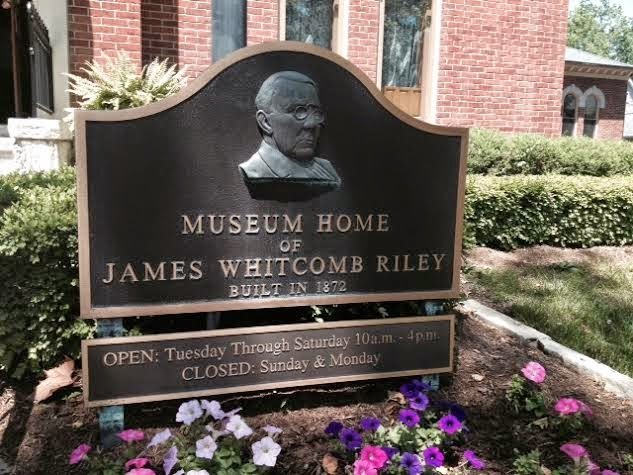 Tucked in the old Lockerbie neighborhood just off the trendy Mass Ave in Indianapolis is the James Whitcomb Riley Museum Home. Riley was an incredibly famous poet in his time, touring with Mark Twain and corresponding with famous authors like Rudyard Kipling. 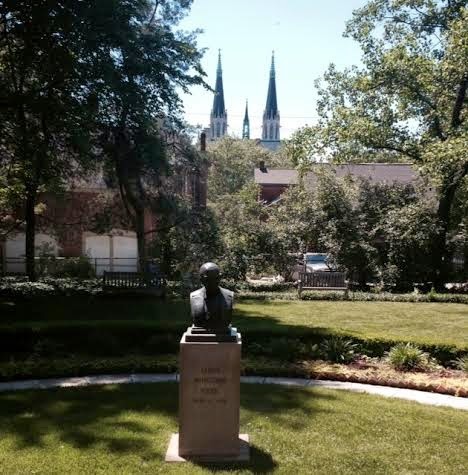 His name might not be as well-known as their's now, but most people still remember his "Little Orphan Annie" poem and all Hoosiers are raised on his poetry. I recently visited the museum and just loved learning more about Riley. In addition to sharing tidbits about his life and his years spent living in the home, the tour guides were a wealth of information about the house itself. It's one of the few homes that still has almost all of its original furniture and artwork. It was beautiful! Riley was known as the "Hoosier Poet" and most people in Indy might not even realize that Riley Children's Hospital was named in his honor. He was a tiny man, only 5' 6" and in his later years his health declined rapidly. He was only 66 when he passed away. If you're interested in visiting the home you can find more info at their site. 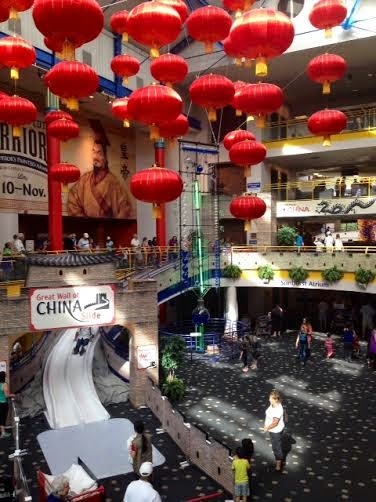 It's definitely worth the trip! More Wordless (or today, not so wordless) Wednesday here. Book number five, we're getting close to the end! The plot summary of The Small House at Allington (below) is the first one that sounds like something I'd pick it up with no prior knowledge. "Engaged to the ambitious and self-serving Adolphus Crosbie, Lily Dale is devastated when he jilts her for the aristocratic Lady Alexandrina. Although crushed by his faithlessness, Lily still believes she is bound to her unworthy former fiance for life and therefore condemned to remain single after his betrayal. And when a more deserving suitor pays his addresses, she is unable to see past her feelings for Crosbie. 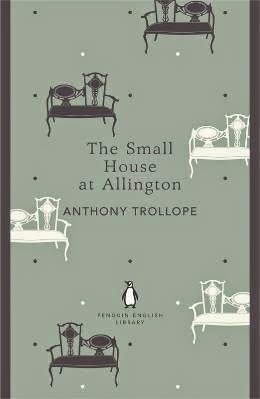 Written when Trollope was at the height of his popularity, The Small House at Allington contains his most admired heroine in Lily Dale a young woman of independent spirit who nonetheless longs to be loved and is a moving dramatization of the ways in which personal dilemmas are affected by social pressures." 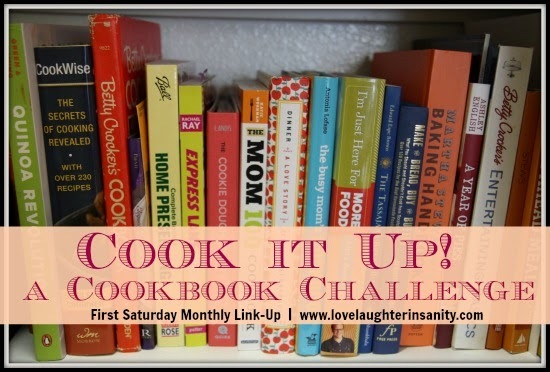 Trish is hosting a fun event to encourage us all to dig a bit deeper into our cookbooks. So I decided to join the fun and check out a Mediterranean cookbook. I am a huge fan of my slow cooker. When everyone in your household works full time, having a slow cooker can be the difference between a stressful night and a relaxing meal. Lately I’ve been on a Mediterranean food kick, so this was a perfect pairing. There are 101 recipes split into different categories. I love that the ingredients focus on fresh vegetables, fruits, fish, whole grains and heart-healthy fats. I love using my slow cooker, but I am not a fan of recipes that tell you to dump in three cans of condensed soup and a stick of butter. Eating a meal that I cook fresh in the evening lets me control the ingredients I’m using, so I love that this slow cooker cookbook does too. Now the down side to that is that from what I saw most of the recipes require a lot of prep work. For me, this isn’t a deal breaker, it just depends on my mood. If I make a slow cooker recipe that has lots of prep, I make the whole thing the night before and pop it in the fridge. Then in the morning I just start up the slow cooker. One aspect I loved about the book was the inclusion of slow cooker tips at the beginning of the book. I’m new enough to the world of cooking that I learn something new every time I read one of those. One thing I disliked was the prep time and cook times were not included in each recipe. I also wish that I’d had a hardcopy of the cookbook instead of an e-book. I like to make notes on my recipes while cooking and I really like seeing photos of the finished product with each review. I definitely don’t think cooking with e-cookbooks works well for me. 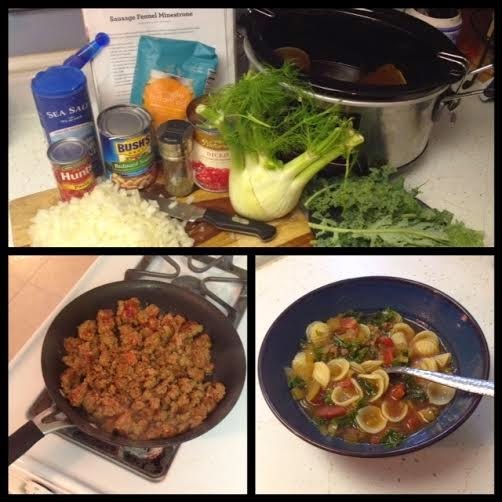 There were a ton of soup recipes that looked great, but the first one I tried was the Sausage Fennel Minestrone. It turned out well, great flavor and consistency. It did take a ton of prep work and in the end the Huz and I both thought it was good but not worth the work. I did love that it got me to use a few ingredients that are outside of my comfort zone like fennel and orecchiette pasta. 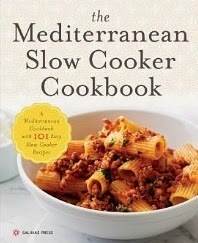 BOTTOM LINE: A good cookbook if you love Mediterranean food, which I do. A little too much prep work for some people and it would definitely work better as a hardcopy cookbook instead of an e-book. I'm looking forward to trying more recipes from it. I received an ebook version of the cookbook for an honest review. Photo of minetrone by moi. In my quest to read books set in Australia and New Zealand before my trip there next month I have encountered some interesting books. 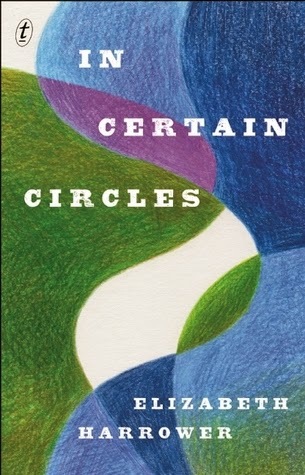 When I was sent a copy of In Certain Circles I realized the story behind the novel is almost more fascinating than the book itself. Decades after it was written, this quiet novel is finally seeing the light of day. Set in Sydney, we meet two sets of siblings, Zoe and Russell, a wealthy pair whose lives are brimming with possibility and then Stephen and Anna, who are from a lower class and recently orphaned. We follow the four characters through a few decades of their lives. Despite their best efforts their paths cross and crisscross again and again. 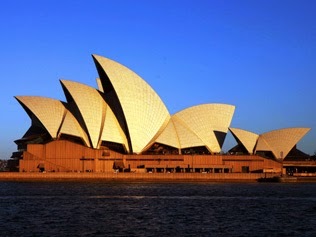 Zoe and Russell both leave for Europe, but eventually find themselves back in Sydney. Anna and Stephen must work to make ends meet, their options much more limited because of their situations. The book has a distant feel that radiates from every page. Even when I was reading about what a character was thinking I still didn’t feel like I understood why they felt that way. It was also odd that all the major action of the book, falling in love, weddings, death, etc. seems to happen off screen. All we see as the reader is the aftermath and the quiet reflection of the decisions. That’s not always a bad thing, but in this case it just felt like you were missing crucial parts of the story. BOTTOM LINE: Some of the writing was beautiful and profound, but the stiff nature of the novel left me feeling cold. I wished I’d had the chance to get to know the characters better. I felt like I was never welcome into their certain circles.